Having a planned schedule and updating it frequently helps people doing bikepacking and ultra-distance cycling races to stay focused, motivated and assess their rate of progress towards the finish. Many people start ultra-distance bike races with very basic schedules that only consist of knowing the average distance that they hope to ride per day. I recommend making a far more detailed schedule because even if you don’t follow it very closely, the task of making it will help you to understand the route far better and it’s helpful to have during the race as a motivational and strategic tool. The schedule should contain intermediate goals to reach certain points by certain times. I find that I ride faster and I’m more efficient with my time when I have such goals than when I have no specific short-term goal and instead only have the distant goal of the finish line to think about. On this page, I describe the factors that should be considered when making a race schedule. When calculating the average distance to ride per day to achieve your target finishing time, remember that you’ll probably do some bonus kilometers along the way. For instance, in the Transcontinental Race your total route length may be 4000 km and you may want to finish before the finish party at the end of day 15. You would think that having a goal of riding 266.7 km per day should work well, but in a self-supported race you will always ride some extra distance due to riding around towns to find food or accommodation, due to detours because roads are closed or you miss a turn. Unplanned bonus kilometers are likely to make the distance actually ridden be between 1% and 3% greater than the planned route distance (possibly much more if you are really bad at either following or making a route). This is not much and it equates to about 3 to 8 km per day if doing 267 km per day, but it can easily accumulate so that after doing 14 days of 267 km per day, you realize on the morning of day 15 that there is more than 100 km more left to do to get to the finish that day than you had anticipated, so you are now unlikely to make the finish party. In addition to riding bonus kilometers, other delays could be encountered due to weather, mechanical problems, health problems, etc. Some people therefore try to keep to a schedule that gives them half a day or a full day of buffer to allow for any such mishaps to occur and still be able to reach the finish before their goal. I would therefore not recommend planning to average 267 km per day, I would instead encourage adopting a plan for an average of 280 km per day or more (i.e., about 5% extra). This would allow for about half a day of delays and to do an extra 2% of bonus kilometers and still arrive on schedule. Although using a simple strategy of averaging a certain distance per day may work adequately, I would advise you to make a slightly more detailed plan that allows for variations in terrain and physical changes during the race. Doing so will allow you to have a better idea of how close you are to being on a realistic schedule during the race. Everyone knows that it is harder to cover long distances in hilly or mountainous terrain than in flatter terrain. If you’ve done much riding in such places then you should have some idea of how to adjust your expected rate of progress based on your typical cycling speed and Moving Percentage in different types of terrain. Personally, despite hoping to average 300 km per day in the 2016 Transcontinental Race, I was entirely satisfied with only doing about 700 km in 3 days of riding across the Alps on Days 4-6. My progress was similar to my planned schedule and I made up the distance deficit before and after to achieve my goal of 300 km per day by the end. To judge how hilly a certain section of route is, I don’t just look at what the biggest climbs are because I know that a route with repeated small climbs and descents (a saw-tooth profile) can be at least as tough and slow as one with just a couple of long climbs and descents. I therefore pay close attention to how much elevation gain there is per 100 km of riding for each section of the route and adjust my expected riding speed accordingly. I generally consider under 700 meters of total ascent per 100 km to be relatively flat and I should be able to maintain a decent speed, 700-1500 meters per 100 km is hilly and will slow me down quite a bit, and over 1500 meters per 100 km is mountainous and will slow me down a lot. Unfortunately, different bike computers and different routing tools use slightly different methods of calculating elevation gain, so corrections often need to be made. Your schedule should also be affected by the changes you expect to see in your physical condition during the race. You’re likely to be freshest in the first few days of the race, and so be able to ride faster and for longer than later in the race. Many people report being most physically tired around days 4-6, but after settling into the race after about a week, they start to feel stronger (as long as they haven’t acquired any other physical problems). Having estimated your rate of progress during each part of the route (based on the terrain and your anticipated physical condition), you can combine this with where major towns, checkpoints, and landmarks are to create specific goals and a rough schedule. While looking at the towns along your route, you should notice any large gaps that are unlikely to have many services so that you can anticipate and prepare for this ahead of time. During the race, I don’t worry about sticking too closely to my original plan, but having the plan allows me to track how I’m doing against my target. For instance, if I stop one night 50 km beyond the place that I had tentatively scheduled to reach, and the next day I am 80 km beyond the tentatively-planned goal for that day, then I know that I’ve done an extra 30 km ahead of what I had anticipated. This may be despite doing only 280 km that day. So instead of being disappointed that I was 20 km short of my planned 300 km per day average, I can be pleased to have done 30 km more than I had anticipated. Having this more detailed and realistic schedule therefore helps my Mood & Motivation to stay positive, especially during difficult days. I actually prepare multiple schedules before the race: One that is reasonably aggressive, for the best-case-scenario, that I expect to only be possible if everything goes perfectly with my fitness, the weather, etc. The second one is far more realistic and I expect to be able to quite comfortably keep to it unless I have some major problems. I’ll probably be riding somewhere between these two and so I can gauge my progress by looking at how close I am to each schedule at the end of each day. A big advantage of creating one or more reasonably detailed schedules is that I can relax in the first few days of the race, mostly ignore what other riders are doing, and simply stick to my plan. Many other people use the information of what other people are doing to decide how far they should ride and how much rest they will allow themselves. This is unlikely to be an optimal strategy, so I encourage you to know your own limits, ride your own race, and don’t look at the tracker website too much. You can easily get into trouble with injuries and fatigue by overdoing things, or you may underachieve if you don’t know how much you are capable of handling. People who have more experience at doing this style of riding will find it easier to make a detailed schedule that is likely to be quite realistic. Even so, I encourage everyone to give it a try because it can be very helpful during the event even if you are not perfectly aligned with the initial plan. Many people might not need or want as much information as I prepare for myself, but it works well for me. If you can maintain a pace of at least 300 km per day, then you are likely to finish in the top 20% of all starters and the top third of all finishers. 240-280 km per day is likely to put you in the middle of the field. 200 km per day is still a great achievement and will mean that you are towards the back of the field, but normally not last. But what do the fastest people average? In most self-supported races, the top riders will ride at least 600 km in the first 24 hours, and then “settle down” to a rate of about 400-450 km per day. After James Hayden won the 2017 Transcontinental Race he posted his daily totals on Facebook to show how he covered over 4000 km in just under 9 days. The following are his daily distances, using his main overnight breaks as the dividing lines rather than being split rigidly into 24-hour blocks. James was around 4th position for a lot of the first half of the race, then slowly moved past his competitors, eventually taking the lead during the sixth day and finally won by about half a day. His overall average was 448 km per day, but if the first day is ignored then it was still 426 km average during the other 8 days. Having created one or more schedules before the event, your schedule is likely to need revision almost as soon as you start. You will repeatedly need to make strategic decisions about when to ride, when to stop to refuel, when to sleep, for how long, and maybe which route option to take. Being physically exhausted and mentally tired causes such decisions to be far more difficult to make than normal, but some of them will be extremely important. It’s important to remember in such situations that in a unsupported bike races, riders are not only forbidden from receiving any physical support, but they also shouldn’t receive any strategic support once the race is underway. Emotional support from friends and family is always allowed, but getting information or advice from other people is against the ethos of being solo and unsupported. Before the race, riders can discuss things as much as they want with anyone, but communication about what is the best strategy and schedule should be avoided once the race has started. Riders should make sure that their supporters are aware of this. Before the race starts, you can do some research to know what the typical weather conditions are for each part of your route. Websites like Meteoblue and ClimateData contains historic average high and low temperatures for each month of the year for every city in the world, and also typical wind directions and intensities. 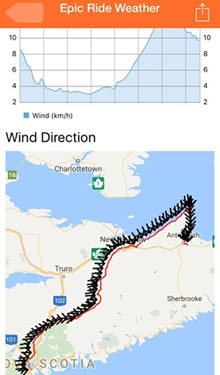 Wind is a very important factor, so you may want to look at the Wikipedia page on the list of local winds to know whether there are any common extreme wind conditions to watch out for along your route. Weather forecasts can be used to adjust your schedule during the race to try to ride when and where the weather is most conducive to making good progress. Many weather forecast apps on smart phones don’t include wind information, one that does that I’ve used a lot is Weather Mate for the iPhone. Apps like Weather Mate give the forecast for specific locations for the upcoming days, but you’ll often ride through multiple regions in a single day in a bikepacking race, so the best tool I’ve found to get a weather forecast for a long ride is the Epic Ride Weather app. It allows you to import a GPX file of your route and set a start time and it will then display temperature, rain, and wind across your entire route at the times when you expect to be at each place, including a map showing the wind direction. You can play around with the start time to see when would be the optimal time to ride and when to rest. Another useful tool for understanding what the wind is doing is the WindyTV website. This displays the current wind direction and strength across an entire region on a beautifully animated map. Drag the pointer along the bar at the bottom to see the forecast. In addition to deciding how to schedule your riding and rest stops, weather information can sometimes be used to decide which route option to take. People rarely do this, but there have been several instances in previous editions of the Transcontinental Race where it may have been wise to do so. In the 2016 Transcontinental Race, most people rode along some of the Croatian Adriatic coast on their way between the Italian Alps and the Montenegran highlands. By the time the majority of riders had arrived at the coast, a strong local off-shore wind called the Bora was blowing hard. People reported having serious problems controlling their bikes in the crosswinds, getting blown towards the railing or veering into traffic, and when they turned the corner and faced the wind directly they sometimes had to get off of their bikes and push. At least one person stopped for 24 hours to wait for the wind to calm down because they were so afraid of riding, but it was still equally bad the next day. I was lucky and had chosen a route before the start that stayed 50 km or more from the Adriatic coast, for reasons other than the possibility of the Bora wind arriving. Fortunately, I had mild winds that were sometimes pushing me slightly. I’d heard a day or so beforehand that strong Bora winds were being forecast for the coast, but I hadn’t imagined that it would be such a problem for people who had chosen the coastal route. If they had known how different the conditions would be on each option, then some of them may have chosen differently. Another situation might be if extremely hot weather is predicted and you have an option between a more mountainous, but shorter route or a flatter but longer route. The temperature should be a lot lower at higher elevations (about 0.65°C cooler for every 100 meters climbed), so the more mountainous route may be more comfortable. Riding more at night and resting more during the day can obviously help to avoid extreme heat, but most people are not aware that this is also a good strategy to avoid the worst of a consistent headwind because winds tend to decrease when the sun goes down. How winds, temperature, and elevation affect cycling speed is addressed in the Environmental Factors page of the Factors that Deterine Cycling Speed section. The amount of daylight and moonlight available each day is far more predictable than the weather. The Transcontinental Race has typically started in northern Europe in early August when there is about 16.5 hours of daylight (including twilight) and ends in southern Europe in mid-August when there is only about 15 hours of daylight and twilight. Personally, I don’t enjoy riding at night very much (mainly because of the lack of views to keep me interested and motivated), and so the amount of available daylight normally affects how far I ride per day, but this may not be as important for other people. Timeanddate.com is one of many websites that gives information about sun and moon rise and set times for any city and any date. Night riding is far more tolerable for me when there is a decent amount of moonlight, so I know that if I have a clear night and a reasonably full moon then I’ll be comfortable doing a long night ride. To ride further in a given day, you may choose to ride later into the evening/night, and so stop later than on other days. However, if this means that you’ll get on the road later the next morning and so have less time to ride the next day then you haven’t actually gained anything (unless it’s the final day of the race). You’re effectively taking some time from tomorrow to maximize today. Although you’re not gaining anything overall by shifting your schedule around, there are several reasons why it may be sensible to do so. For instance, if there is a section of road or a city that I expect to be very busy during the daytime, I may choose to push through it at the end of the day or at night when it will be quieter. Or if I’m approaching a scenic section that I want to be able to appreciate during the daytime then I may time my rests correspondingly. The weather can also be an important factor: If there are headwinds, rain, or extreme heat predicted for the next day in a region that I’m approaching then I may push extra hard and ride extra long the day before to avoid it as much as possible. The manual for the Transcontinental Race (TCR) includes the wise advice to “Never scratch at night.” If the race is becoming too much and you feel that you cannot continue, then don’t take any decision when you are in your weakest state. When the sun has risen the next day, you may feel quite different, mentally and physically. Obviously, certain injuries may happen that mean that you have no choice but to scratch regardless of how long you wait. If you have done as recommend above and started the race at a pace that gives you at least half a day spare in case problems are encountered then you may be able to take some time off of the bike and still get back on schedule before the end, or not far behind. In addition, there is normally no deadline by which you must reach the finish to be recognized as completing a bikepacking race, but race organizers may require that you contact them if you plan to be inactive for a significant amount of time. This page is in the Mental Approach & Strategy section. Some bikepacking races require participants to plan a route between various checkpoints, so the next page covers Route Planning.